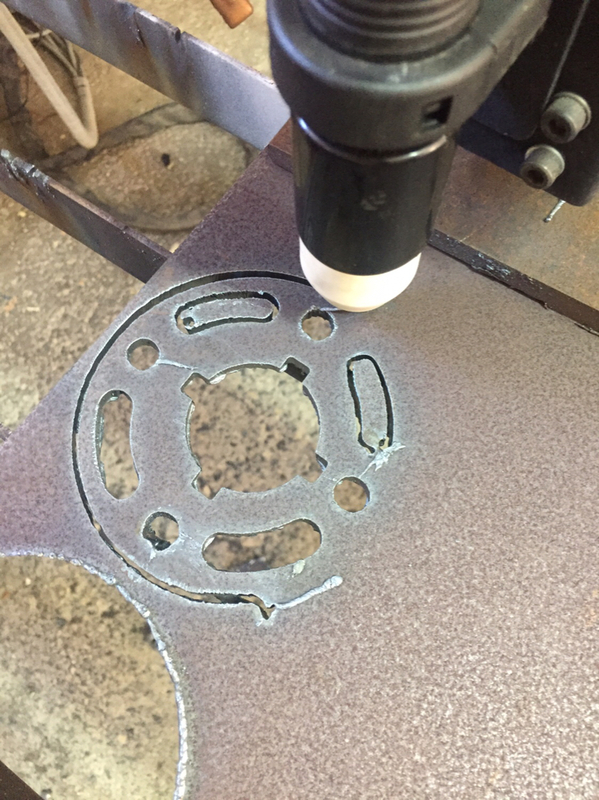 Hi All on my home made Cnc plasma I have a part with multiple holes and they are not in the correct places ..... what could be the problem? .... it’s like it shifted to the side, my steps per is correct.. I’m using mach3 and sheetcam, what’s strange is when I have this specific part cut it causes this problem, I was told I am loosing steps on nema 23 stepper motors or emi , but emi only effects the system before the torch fires and if I’m loosing steps how is this happening? ... iv attachet pix of the drawing and part, if you look closely it looks like the center geometry has shifted to the right. What happens if you re-run the program over the same spot? Does the pattern shift each time, or follow the same path? I had a similar problem several years ago after the motherboard on my computer was replaced. As long as the torch was off the pattern was correct. As soon as I fired up the torch the table would lose position at various times. I went back to the manufacturer and asked for their advice on which motherboard I should be using. They sent me a different motherboard and the problem immediately went away. Some computer systems and components have trouble with the electrical noise that a plasma cutter puts off. Hi plasmamett, I’m using a very old mother board and running Windows xp ... are u say I should use a later mother board?.... what mother board are u using? The replacement motherboard that WinCNC sent me is made by ASRock. I don't recall the exact model. I am using Windows 7 on this particular computer. WinCNC indicated that ASRock motherboards are more tolerant to the electrical noise issues. Is this the mother board you are referring to? That is the correct brand but I'm not sure which model I have. It is going to be slightly different for your computer because you are running Windows XP. I'm at home right now and my plasma table is at work. I check on Monday and see which model I have. Burr Barrel CNC plasma parts tumbler + Surplus CNCs (Vertical machining center, air..